Anne-Marie Wurzel Featured in Florida Realtor Magazine! 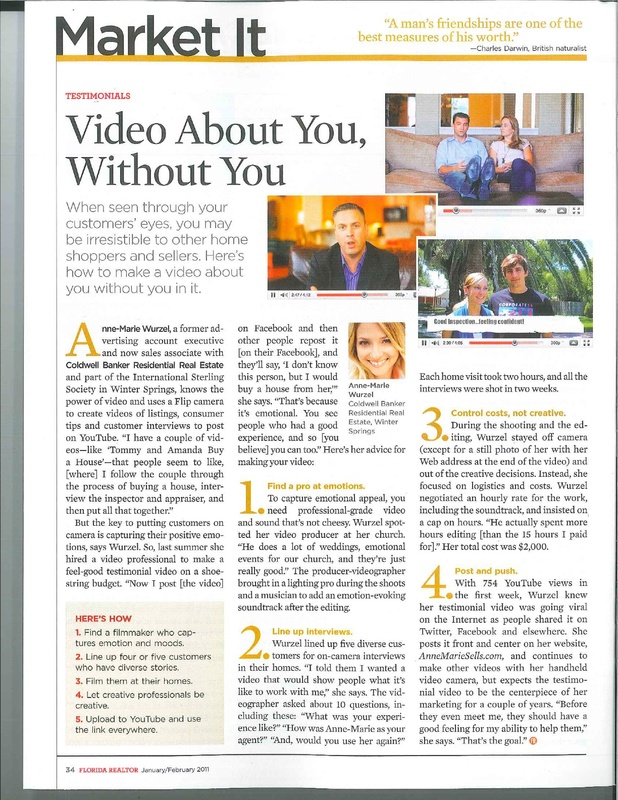 Anne-Marie Wurzel Video Marketing - Featured in Florida Realtor Magazine. When Florida Realtor Magazine, Editor in Chief, Doug Damerst, received the link to my video, he revealed to me that before he watched it said to himself, “So what’s so special about this video?” After watching, he immediately contacted me and said, “You’ve got something unlike anything that’s out there in that video.” He did a feature article in Florida Realtor magazine about how to do a video about you, without you. As a Realtor, testimonials are what we build our business on. Written testimonials are great, and I have them featured on my website. But a video testimonial speaks volumes, literally. I can’t tell you how many Realtors, mortgage brokers, customers and potential customers have contacted me because of this video. It’s a testament to how I work, and gives comfort to those who hire me because they know, I will work for them in the same professional and aggressive manner. Past customers introduce me more frequently to friends and family they know who have a real estate need. When testimonials and referrals are a Realtor’s lifeline to success, it’s important to capture those success moments for others to see. And now that you’ve seen the video, and the many other video testimonials, who do you know with a real estate need that you can introduce me to?